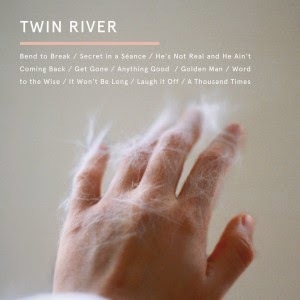 At their best, Twin River provide the kind of reverb-drenched power pop that made Alvvays such a sensation in 2014. Whether it's the pure noise-filled "Laugh It Off", or the chorus of ooos and wooos of "Secret In a Seance", you can hear the pop sensibility that lives beneath all of the shoegazing guitar tricks. With high-pitched vocals that seem to defy their arrangements, many songs have a vibe that's reminiscent of '90s staples Throwing Muses and Belly. The inclusion of a whirring organ adds the the unique nature of the music. A snotty attitude on the shadowy yet slick "Word To the Wise" morphs into an excellent warped guitar solo. A '60s girl group influence is front and centre on "It Won't Be Long". On the complete other end of the spectrum is "A Thousand Times", which has a deep roots tinge. Too many songs on the album take too long to form, or never manage to fully form at all. During the 10-minute plus "Golden Man" a whole lot of time is spent for the song basically to stand still. "Get Gone" is a gauzy mid-tempo number with no spark. Slowing things down even further is "He's Not Real and He Ain't Coming Back", which despite having the majesty of a solar flare, has precious little in the way of combustion. Strip away the slumbering tracks and there's quiet a nice little EP here. Alas, that's not what we're presented with, which makes it a little more difficult to fully immerse yourself in Should the Light Go Out. Best tracks: "A Thousand Times", "Word To the Wise"